Information is power, reducing costs with it is innovative. Typical data center planning often produces a solution that is not optimally flexible, nor cost-efficient, due to the mismatch between the needs of the firm’s IT organization, real estate group, business units, and risk-security operation. Rather than broker a compromise where each group gives up some of their requirements, the Fidelity team relied on a trust-based collaborative process involving senior level sponsorship from all stakeholders called CENTERCORE. It is a rapidly-deployed, on-premise, hardened data center that scales easily, has the feel and functionality of a traditional data center, and easily adapts to a changing IT landscape. Enterprise outcomes for the initiative are beyond the original projections. In 3 years, the firm has reduced its data center footprint by 20% and achieved a 50% per year power cost avoidance. The total projected cost avoidance over 15 years for the Data Center program is on the order of 48% for real estate costs alone. Data center innovation provides responsive capacity while preserving the stability, resiliency, feel and functionality of a traditional data center. 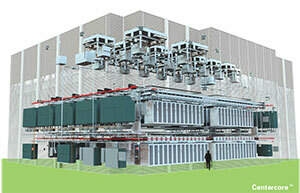 It represents the future of data center design for Fidelity and other industries. We want to know your thoughts on the benefits of applying the knowledge and rigor of a strong real estate organization to the needs of the IT technology side of the business. Share your experiences in the comments below. In 2013, Fidelity received The Global Innovator’s Award presented by CoreNet Global for this industry innovation. You can learn more about this remarkable initiative during the CoreNet Global 2015 Asia-Pacific Summit in Hong Kong in March, Joe Higgins PE of Fidelity will show you the requirements necessary to have in place prior to undertaking the business case development and executive adoption of a data center strategy. For more details please visit www.corenetglobal.org/hongkong2015.